Anyone who has read Bernard Cornwell’s “The Last Kingdom” series of novels has got to appreciate the TV show based on them. The series began on BBC but has since been picked up by Netflix and premiered exclusively on the streaming platform this month. But, if you’re not a Netflix subscriber or simply want a hard-copy of the season it will hit stores on Dec. 11. The books are what you could call historical fiction, meaning, they are based on historical facts but manipulated to create better stories. Cornwell tells the tale of English-born Uhtred (played by Alexander Dreymon) who was brought up by Danes in the late 9th century after his family’s land was taken away. Uhtred rises to power under King Alfred (David Dawson) but having fought on both sides his objectives are always conflicted. 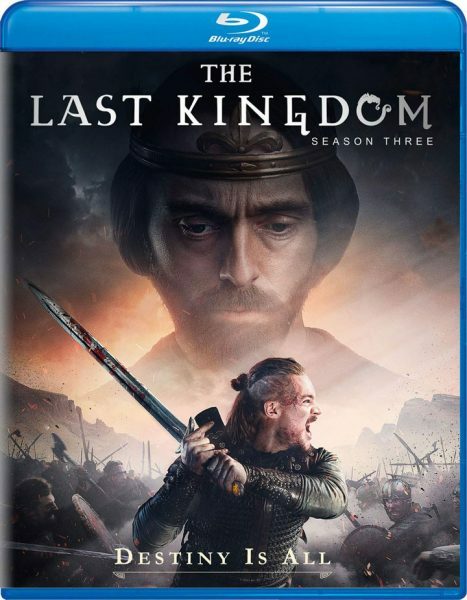 The third season of The Last Kingdom from Carnival Films (distributed by Universal Pictures Home Entertainment) is presented in 1080p at 1.78:1 aspect ratio with English DTS-HD Master Audio 5.1 and Dolby Digital Audio 2.0 soundtracks. The 2018, ten-episode season has a total runtime of 8 hours, 49 minutes. The Blu-ray only comes with one bonus feature: “The Battles of The Last Kingdom Season Three” and unfortunately no digital copies (but of course can be streamed or downloaded from Netflix). The Last Kingdom Season Three 4-disc Blu-ray edition retails for $44.99 and is available to pre-order for $34.89 from Amazon. The DVD is list-priced $39.99 but can be pre-ordered for $27.05.